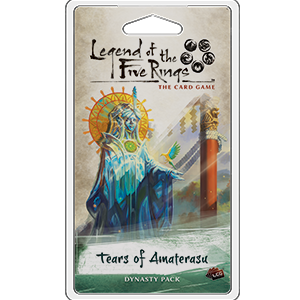 Expand your Legend of the Five Rings: The Card Game collection with Tears of Amaterasu, the first Dynasty Pack of the Imperial Cycle! As the first Dynasty Pack in Legend of the Five Rings: The Card Game, Tears of Amaterasu features three copies of twenty new cards and expands on the theme found in the Core Set of the game. Offering new tools for all seven clans as well as new neutral cards to supplement any deck, Tears of Amaterasu is the perfect next step for Legend of the Five Rings: The Card Game. Expand your Legend of the Five Rings: The Card Game collection with Into the Forbidden Cit , the third Dynasty Pack of the Imperial Cycle! Children of the Empire is a premium expansion for Legend of the Five Rings: The Card Game, with this being a new level of product that features 234 cards. Experience the wonders of the Imperial Cycle with Fate Has No Secrets, the fifth Dynasty Pack for Legend of the Five Rings: The Card Game. Expand your Legend of the Five Rings: The Card Game collection with For Honor and , the second Dynasty Pack of the Imperial Cycle! Experience the wonders of the Imperial Cycle with Meditations on the Ephemeral, the sixth Dynasty Pack for Legend of the Five Rings: The Card Game! Expand your Legend of the Five Rings: The Card Game collection with The Chrysanthemum Throne,, the fourth Dynasty Pack of the Imperial Cycle! Fantasy Flight Games is proud to announce the Disciples of the Void, a Phoenix Clan Pack for Legend of the Five Rings: The Card Game! Legend of the Five Rings: The Card Game is a Living Card Game set in the world of Rokugan, the original setting for the Legend of the Five Rings collectible card game.